A scene on the River Cam near Cambridge showing a boat progressing along. 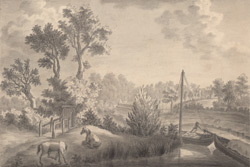 There are a couple of horses on the river bank and a number of country cottages in the background. The River Cam was the quickest method of transporting goods in and out of the town, particularly as the town had developed around a crossing point of the river. The artist is Peter Spendelowe Lamborne (1722-1774), an engraver and architectural draughtsman who trained in London with Isaac Basire, and who later worked around Cambridge.